19 Multiplayer Maps for use with Both Horde and Matchmaking and the deleted chapter from the campaign can be yours for only 400 MSP ($5). In other Gears 2 news, The game will become on Demand Title, and will receive 4X XP up until the Halloween XP event featuring 31 XP and A Horde change titled "Chainsaw Massacre". 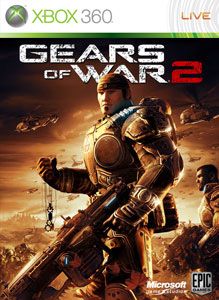 "This content pack features all 19 downloadable Gears 2 multiplayer maps and a bonus deleted single-player chapter, "Road to Ruin," from the Gears of War 2 campaign. For multiplayer fans, this pack brings together the complete set of Gears 2 multiplayer maps: Allfathers Garden, Canals, Courtyard, Flood, Fuel Depot, Fuel Station, Gold Rush, Gridlock, Grind Yard, Highway, Mansion, Memorial, Nowhere, Sanctuary, Subway, Tyro Station, Under Hill, War Machine, and Way Station—everything in the Flashback, Combustible, Snowblind, and Dark Corners downloadable packs combined."